So, I'm super excited (and a little jealous frankly) that the folks at chick downtown have offered to GIVE IT to one of my readers. Just leave a comment on this post and I'll pick a (lucky) winner at random next Thursday, July 30th at noon CT.
p.p.s -- the scarfs from Sir Alistair Rai are also rather awesome! Hi, I just found your blog yesterday and love it! Also love the scarf :) Oh I just saw you have a foodie blog, I'm checking it out now! Great, great giveaway! This scarf is so pretty! I would love to add this to my collection. I'm sure it would be on heavy rotation. I love this scarf! Thanks for the giveaway! Ahh! Is it too late?! I so love the scarf. And I have a little birthday coming up this Saturday to become 40ish. great choice. count me in. oooh, so pretty! love your blog....part of my daily naptime me-time...so, thanks! Beautiful! Thank you for this very pretty giveaway! Thanks for sharing with your readers... so generous. i lovee that scarf! it is such a fun pattern! Oh awesome scarf! I was just thinking I should go pick up a couple. Love it! I probably missed the cut off, but I just now go this in my feed, I became a scarf fanatic last year and need this for my collection! gorgeous, i want it want it want it. What an awesome scarf! Thanks! Would be perfect with the outfit you've described- beautiful! Beautiful! The soft gray with pops of color are wonderful. LOVE the scarf....of the fun travels we could have together! I'm in love! So fresh and expressive. Here's to hoping it's my "lucky" scarf. Pink and yellow and grey... so one of my favorite color combinations. I hope I have so luck! so cute! scarves are my defense against aggressive air conditioning here in new orleans. So lovely, my fingers are crossed! oooh! Big fan of the blog (and your little foodies blog) and this scarf! Hope I win it and keep posting great stuff like this. Totally gorgeous! It's so YOU! I would love to see photos of some of your scarves - you have the best accessories! i'm not sure if i'm too late but i'd love to win that pretty thing! jealous, indeed! it is a lovely scarf. Oh, that is beautiful! I love it. oh, pick me pick me! i so hope my number comes up! I love autumn and winter because of all the scarves I get to wear and this one would indeed inhance my collection!!! completely and utterly in love with the color palette - it's gorgeous! It's gorgeous! Thanks for the giveaway! Oh, I would look so cute bouncing around town in this lovely scarf. Hope I win! Thanks for the giveaway! So pretty. I want to be draped in watercolor. I will happily take the scarf- no problem at all! Thanks for the giveaway and your inspiring posts!! A scarf always makes me feel more put together! Thanks for all the inspiration on your blog. Truly lovely. I love that scarf and your blog! I am in love with that scarf... This could be the beginning of a beautiful relationship. Also, I love yer blog. Don't ever stop. I can never have too many scarves... that one is particularly gorgeous. love your taste, love your blog. LOVE that scarf. i want it!! I really love those colors and would love to be included! What a great scarf - I would love it. Love the blog too! This is beautiful! I hope I win! Pink, grey, mustard, purple, I can't get enough of this color combination. I can see a bedroom or living room made up of these colors too. Wonderful colours in the scarf! what a pretty scarf! i can't wait to check out the rest of them! I love the colors, and your outfit suggestion. I hope I win! what a standout piece to a simple summer outfit! is there anything more chic than a scarf? and it looks light enough for summer... just lovely. I love the color combinations. Such a perfect scarf! Great choice! It would look so fab with my outfits when I'm playing tourist in Tokyo! pick me! pick me! i LOVE scarves! i love scarves and i really, really love this scarf. i have my fingers crossed!!!!!!! LOVE it! I'd save it for my trip to Italy in October. Help me start my own scarf collection, please! :) I have what I call "scarf-anxiety"...I can't seem to get started, but that one is divine! Hot diggity dog, I want that scarf! I'm already hankering for fall ( I know, right?) and this would be a perfect addition to my fall wardrobe! I love love love this scarf! And I'm such a fan of your blogs...they are daily reads for me. ohpleaseohpleaseohplease pick me. That's really pretty. I feel like it would just close the end of summer so nicely and welcome in the Fall. I was just thinking I need more scarves... thanks for the drawing! I cannot tell you how much I love this! Thank you!! I love scarves--would love to win this beauty! Gorgeous! I bought a new scarf recently and a pen leaked ink all over it in my bag. This one is beautiful. Wow! If only I were so lucky as to win that scarf...its just beautiful! Love the scarf, It would make a perfect outfit for me! Oh man, I never ever win these things, but it doesn't hurt to try!! I do love the scarf! Oh please, please, please pick me, oh please. Just love the scarf and the beautiful colors. "She does not discard basic standbys of her wardrobe that have given good service and that are becoming. Instead, she integrates them into a wardrobe for the coming season, adding a new belt here, a SCARF there, a fresh jacket or costume jewelry to make something old and beloved look new and fresh"
how beautiful! i'd be so thrilled to add this to my wardrobe!! what a stunning scarf. by the by I made your "beautiful rice" last night but instead of cilantro and spinach I used what I had on hand...parsley, arugula, kale and swiss chard...what a great recipe. The family loved it! beautiful scarf, i hope it finds a home in my collection! thank you for the giveaway. gorgeous! i would wear that scarf all the time!! Love love your blog! Your style is so fun! That scarf, I wish I had a word for it to describe how beautiful it is. I am in love with the colors. Great choice! I LOVE this, and even more would love to win it! Thanks for the opportunity! I might wear it around my waist. What a beautiful scarf! I love it! OOH! LOVE IT! I'M SO IN NEED OF SOME GREAT PIECES TO MAKE THIS PREGNANCY TRENDIER! that scarf is gorgeous!! i've got my fingers crossed. oh, so pretty. I really am loving these scarfs. Thanks for the giveaway. Very pretty; it actually looks just like "you", or how I imagine "you" to look! kidding, but seriously beautiful scarf. I love scarves... and whenever the Southern California weather permits, I wear one.. That one is sooo pretty! Beautiful!! This would be great for sunny AZ weather! Lovely scarf. I love grey and yellow together! Three of my favourite things all in one - scarves, yellow and grey! Loove. The colors are amazing! Would love to wear this-so versatile. i am in love with this scarf. I've been reading your blog for some time now (and the new one!) but this is my first comment! thanks for making days brighter with your beautiful posts! i love dressing up office outfits with scarves almost as much as i love your blog! You make me grin every morning. love your blog and that scarf is gorgeous! what a lovely scarf! the colors are wonderful. thank you! LOVE IT! As a new mom, this would help pull me together and make me look like I've got it under control with style... even if I really don't. Thanks for the chance! love love love LOVE it. shall I say it one more time? What a stunning scarf... I am in love! ahh. i have a slight scarf addiction and this one is soo lovely!! Pretty! I'm crossing my fingers! Nothing completes an outfit for me like a scarf. Love it! Coming out of lurkdom because this scarf is lovely. Inspired use of colors! Good lord, lay that scarf on me! I really need that scarf. Please, please pick me :) Thank you for having the most amazing blog and inspiring me everyday. Oh my, it is beautiful! I think one can never have too many scarves. I can see this with jeans and a white tshirt! PS... giveaway on my blog too that you just may like. This scarf is fabulous! Great giveaway!! Beautiful scarf! Count me in! Divine scarf to transition from summer to fall! What a beautiful scarf! I've got my fingers crossed! Lovely scarf! I am new to your blog, but I seem to have found it on just the right day! Lucky me - a new blog to read and a giveaway! I love scarves! I have one and am looking for more. I had a beautiful one made from Ecuador but my mom really really loved how soft it was so I gave it to her. So I had two and down to one. I'm in the search for another. the scarf is beautiful and reminds me of several I saw at Plowsharing Crafts (a fairtrade organization) just yesterday. my son wanted me to buy a beautiful skyblue scarf with circles. but we were there to get a gift for a friend. i'm looking forward to cooler weather so i can get out my favorite scarves. i feel like having this scarf around my neck will protect fill me with creative thoughts and protect me from all evil. Ingrid. This scarf is lovely! I hope I win! I would love to win that gorgeous scarf! Completely gorgeous scarf! I could get so much wear out of it! so beautiful! i would LOVE to win it! I love it! Great giveaway! That is a gorgeous scarf, I love it! 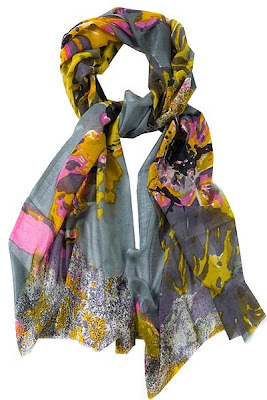 I have just begun collecting scarves and this would be a lovely edition - BEAUTIFUL!! Such a beautiful scarf! I'd love to win it! Yes, please! That would be amazing! Love love love! i love these scarves. i entered 2 other giveaways for tolani scarves and no luck :( - 3rd time's the charm? I think the only thing that I love more than myself is this scarf.